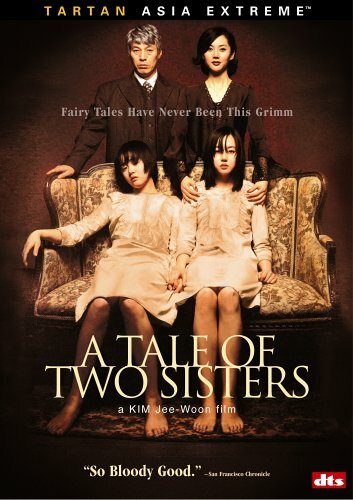 A Tale of Two Sisters is a Korean horror movie based on the folk tale “Janghwa Hongryeon jeon”. The movie offers an unusual blend of family drama, mystery, and supernatural horror that some viewers might struggle to appreciate because of its slow-moving nature. For those who can live without fast action and high adrenalin though, A Tale of Two Sisters may provide a refreshing change, especially for viewers who have grown tired of the many Hollywood horror movies that rely on special effects to deliver the thrills and chills, and all too often place technical trickery ahead of the script. A Tale of Two Sisters is a subtitled movie, and this may put some viewers off, but it is worth persevering with the subtitles because this Asian horror flick has a lot going for it. The opening scene is set in a mental hospital and introduces a teenage girl named Su-mi (Su-jeong Lim), who has obviously retreated into herself after a traumatic incident of some kind. A psychiatrist is trying to coax her into explaining the reasons behind her pain. The rest of the movie is presented as a long flashback sequence that’s interspersed with further flashbacks that provide extra details of the whole sorry business. Su-mi and her sister Su-yeon(Geun- Young Moon) are shown arriving home from the hospital, and their somewhat underwhelmed reaction to their homecoming indicates things are not well in the family home, but it’s obvious right from the start that the two sisters are very close. It’s equally apparent the girls dislike their stepmother, Eun-joo (Jung-ah Yum). Su-yeon, who is not as confident as her sister, seems very timid when she is around Eun-joo, but Su-mi has a more rebellious streak and often appears to be trying to protect her sister from their stepmother. The girl’s father (Kap-su Kim) appears to have problems of his own and seems a deeply unhappy man. He makes several attempts to reach out to Su-mi, and admits he’s been a bad father, but she tells him, “You aren’t even that.” His relationship with his wife also looks strained and the fact that he keeps handing her pills, when coupled with her often strange behaviour, suggests that Eun-joo may also have some mental issues. Early scenes in the movie provide evidence of the deep bond between the two sisters and the scene where they spend time together, beside the lake, is especially heart-warming. The sun shines down on them and the backing music is reminiscent of the kind of tracks used for family dramas, so at this point, A Tale of Two Sisters does not feel like a horror movie at all, but the story gets progressively more creepy as it crawls along. It also becomes more confusing, but everything makes sense in the end, much is not as it seems, and the tale is a lot sadder than it first appears. Then when the tragic truth is revealed it becomes apparent that much of the movie is open to interpretation, so this is a movie that some viewers may want to watch more than once, so that they can view events from a better-educated perspective. One of the creepiest scenes in the movie occurs when Su-mi wakes up in the middle of the night, after already having a bad dream, and sees someone crawling along the floor at the bottom of her bed. As is often the case in Asian horror movies, much of the apparition’s face is covered by long straggly hair and, when it stands up and steps onto Su-mi’s bed, the twisted and contorted nature of its posture adds a few extra chills to an already frightening scene. This is also the first real evidence of a supernatural presence in the house and it does not occur until about 30 minutes into the movie. The two biggest mysteries in the movie are the fate of the girls’ real mother and the secret of the closet in Su-yeon’s room. Su-mi asks her father to get rid of it, but his only answer is to remind her that she is forbidden to speak about the closet. A Tale of Two Sisters is an enjoyable movie, but it’s quite complex and must have been very challenging for the actors to work on, but all of them do a magnificent job and their combined skills contribute much to the effectiveness of the movie. The slow pace takes a little getting used to, but the movie is remarkably void of areas to criticise and proved to be such a big hit with Korean audiences that it won an award for Best Picture at the 2004 Fantasporto Movie Festival. It’s also the highest-grossing Korean horror movie to date. Both these facts say much about the merits of the movie and most aficionados of Asian horror movies will probably love A Tale of Two Sisters. If they give it a chance, many other viewers may love it too.